The 1965 model Cadillac Eldorado was essentially a Cadillac DeVille convertible with a fancy name. Elvis Presley, the "King of Rock and Roll", and George Barris, the "King of Customizers" designed Elvis' Dream Car, a gold-flake 1965 Eldorado convertible with guitar-styled sun visors and rear seat speakers, 14 karat gold plated exterior components and numerous other customizations. The Elvis Dream Cadillac was recently on sale for $119,900. 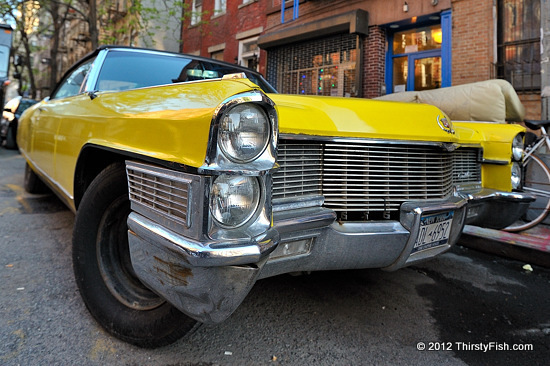 The pictured Eldorado is usually parked across the street from my favorite trattoria in the Alphabet City / East Village area of New York City; Il Bagatto serves truly delicious home-style dishes in a dim lit and ambient setting. The grilled calamari appetizer is a must. El Dorado, "the golden one" is indeed a fancy name for a car. It was the name of a Muisca tribal chief who covered himself with gold dust and dived into a lake as part of an initiation. The term later became the name of the mythical "Lost City of Gold". When confronted by ambitious Spaniards, the Muisca and other indigenous people of the region misdirected the Spaniards to the "City of Gold" so that they would be left alone. Hint, hint, greed blinds you. El Dorado has since taken a new meaning: an imaginary place of great wealth and opportunity.